What does "America is going to fall" even mean? Am I going to stop getting Netflix? I am not worried. You might have cause to be . For your information : A man in India had to go to REHAB to curtail his Netflix habit . 1/2 the day or more of Netflix. Cat 3 wind is 111-130 MPH! That doesn't exist in Iowa except in tornadoes and tornadoes will knock down any house. Everywhere I look in Iowa I see houses that are over a hundred years old. That's old in a state that was wilderness 160 years ago. I could build a concrete or masonry home in Iowa but I don't. Do you know why? It would be stupid as hell. I know it's difficult, very difficult, but try, just for a few minutes: To lift your head out of the sacred, pristine perfect utopia of Iowa. When you talk about "your" America, you're talking about Iowa. That's NOT America, that's a very small (and yes perfect) subset of a subset of a subset of America. It's a big bad world out there: "Toto, this sure ain't Iowa!" she might as well have said. Yes, I know. I have been in 49 of the 50 states and dozens of countries. Maybe not as many as you, but plenty. The point is that concrete houses aren't necessarily better than wood houses. A concrete house is good if you expect it to weather hurricanes. If, on the other hand, you deal with -25 temperatures every winter, it would be pointlessly expensive and more costly to heat. I have heard people make this comment that wood framed houses are stupid but those people are ill informed. My house is sides with thick vinyl backed with styrofoam. This is over a vapor barrier over plywood with expanding foam inside the studs with another vapor barrier and then gypsum wall board. The attic has 32 inches of blown in fiberglass insulation. All of the windows are double paned filled with argon for temperature protection. It is perfectly airtight and the walls are warm to the touch when the wind chill is -50 and dead silent when the wind is 25 knots. The house can deal with the 120 degrees of difference it experiences every six months without cracking. It is heated and cooled using ground source heat pump which the EPA calls the most environmentally friendly way to heat the house. It draws in and conditions outside air to keep it fresh. No fossil fuels are used in my house. There is no need. It so air tight I could almost heat it with a candle. I wouldn't try to build this house in Grenada but it is the right house for Iowa. Expat's belief that it is flimsy is preposterous. Yet again, your myopia obscures your reason. It's not preposterous to say that wooden houses are not as robust as brick - that is self evident to any RATIONAL person; of COURSE wood is "flimsier" than bricks and mortar! I've owned and lived in houses all over the world - all kinds of houses, and without doubt my "Micky Mouse house" was the flimsiest of the lot - and the most expensive to boot! When Gilbert devastated Jamaica in '88, my mother-in-law's brick house built in 1947 suffered only superficial damage, and 90% of the BRICK houses that suffered major damages lost their roof, but the basic structure of the house remained intact. Compare that to the wholesale destruction of wooden houses by Michael, and that was "only" a cat 4. Now the question you could ask: Is flimsy bad? Do you NEED to build a house that'll last 1,000 years? In Iowa, clearly, you don't. Different cultures, different strokes, different houses. Wood framed houses survive earthquakes far better than brick and mortar houses. Otherwise, yeah, I suppose that they aren't as strong over all as a concrete house. The downsides to concrete construction, however, explains why nobody builds them in a huge part of the country. You don't need the strength and concrete comes with a whole bunch of downsides, especially in an environment with 130 degrees between the hottest day in the summer and the coldest day in the winter. Another thing that amazes me about American houses is: nobody ever breathes in natural air! In the winter the heating's on 24/7, and in summer it's the a/c. I guess that goes with your geography: COLD winters and HOT summers! England is neither of both, that's why they build those brick houses: it keeps the house "room temperature". Back in the day houses of the cottage variety used to be solid walls maybe 3 feet thick with small windows, and they were warm in the winter, and cool in the summer. Then we had solid brick walls which allowed taller builds. followed by cavity wall building which used to be an air cavity, but going along with RD's Ply backed with Styrofoam we now build with foam of what ever kind insulation panels between the walls, and older cavity wall houses are injected with expanding foam. We have gas filled, solar reflecting and triple panel glazing .... were almost modern these days. To the point stud walls are probably just liken American ones. Another thing that amazes me about American houses is: nobody ever breathes in natural air! The house I am building now uses ground source geothermal for heating and cooling the house and heating the water for showers and so forth. It has an outside air system that brings fresh air from outside, filters it and either humidifies it or dehumidifies it. That way there is fresh air in the house year round whether it is freezing cold or blazing hot. Here is a photo of the insulation prior to the inside vapor barrier and gypsum wall board being installed. Those are 6 inch studs, meaning the foam is six inches thick. By the way, the EPA lists by geothermal system coupled with the wind power that serves my area to be the most climate friendly heating and cooling system available. 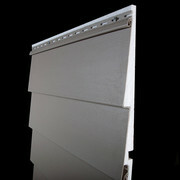 This is the type of siding on the outside. Foam backed for additional insulation. Great stuff, and big up you for being "centsibly sustainable"! The technology is evolving so fast and becoming so cheap ... it's a tree-hugger's (and cheapskate's) paradise! Unfortunately down here in Thirdworldville we don't have the same access as you do to all these high-tech goodies; by the time we get it all home it costs us three times what it costs in Iowa. Caused by small distant markets, predatory governments and local monopolies - a devil's triumvirate.